A well-made Ripe Pu-erh Mini Tuocha, the leaves for mini tuocha are pressed in small bowls and individually wrapped, one tuo weighs approximately 5 grams, each tuo makes one cup (plus repeat infusions). 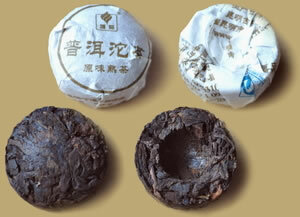 Guyi has selected good quality ripe Pu-erh leaves for this tea, the smooth flavor will mature and mellow with age. Mini Tuocha is a convenient way to enjoy a cup of Pu-erh tea at home, at work or anywhere carrying large tea cakes might be difficult.